This beautiful set has been calling to me since it came in the lovely brown UPS box! As soon as I saw this set, I saw this card in my mind and knew I just had to make it happen! 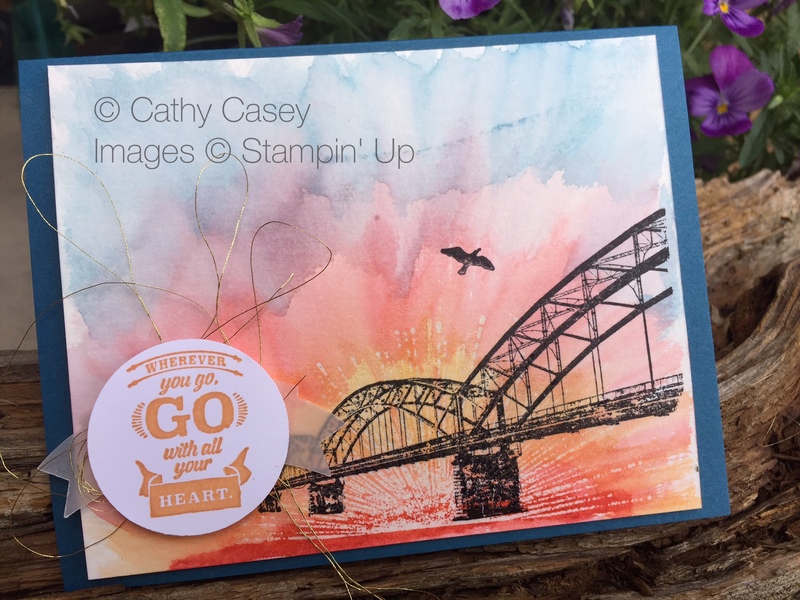 The bridge is stamped in Archival Black ink and the sun ray image is stamped over it in Versamark and embossed in clear embossing powder. The sunrise is watercolored in Watermelon Wonder, Flirty Flamingo, Peekaboo Peach, Perfect Plum and Dapper Denim. 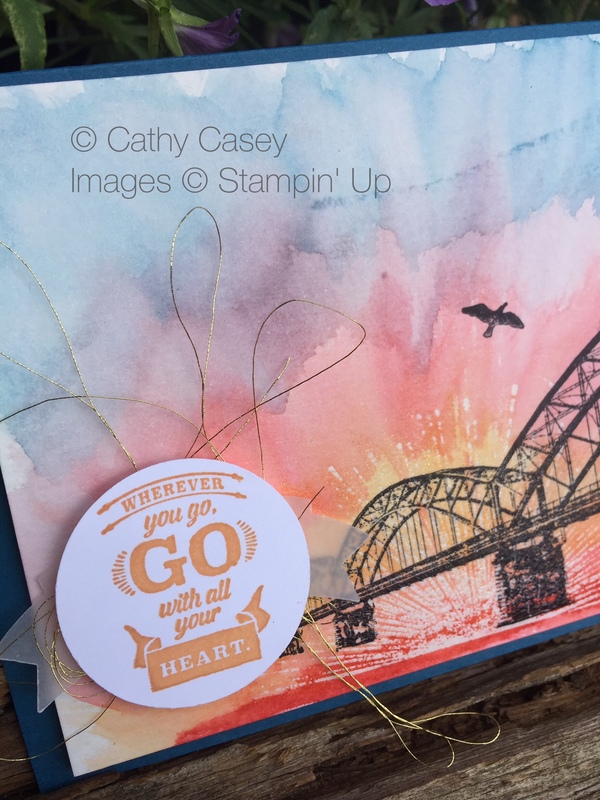 The sentiment is stamped in Peekaboo Peach and punched out with a 1 1/2″ circle punch. A few added touches: Wink of Stella added to the sun rays, the adorbs little birdie, gold thread and the banner punched with the Duet Banner Punch. I hope you have enjoyed our projects this week! 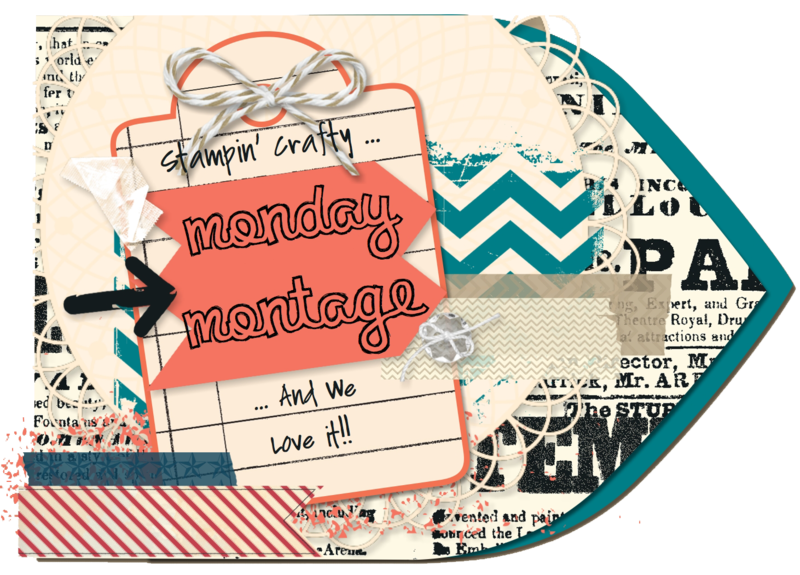 This entry was posted in 2013 Artisan Design Team Finalist, Cards, Punches, Stampin' Up, Watercoloring and tagged featured, Montage Blog Hop, Stampin' Up, Watercoloring, wherever you go by kate80132. Bookmark the permalink. Beautiful!!! Makes me long for some time at the beach! Thank you Bree, it makes me long for the ocean too! Wow! What a beautiful scene! Your watercoloring is amazing. Love this, Cathy! Thank you Amy! I love watercoloring so much!! !